One of the most famous tennis moments in cinematic history is the clash between Terry Thomas and Ian Carmichael in the 1960 Ealing comedy, School for Scoundrels. The scene, unforgettably punctuated by Thomas' sarcastic cries of "hard cheese" as he attempts to psyche out his hapless opponent, was shot at the Edgwarebury Hotel in north London, which assumed the role of an exclusive tennis club. Of course, luxury facilities such as these are still common even in these more egalitarian times, but should you possess the necessary social contacts needed as a sponsor to gain entry, there is still the thorny question of cost. Members' clubs are never cheap. Yes, in return you do get top-of-the-range facilities both on and off court, but what if you can't afford it? For those on a limited budget who can stretch to a monthly gym membership, it is worth checking out the facilities before you join. Many "gyms" offer racket courts along with the usual menu of swimming pool, tread mills and weight machines. 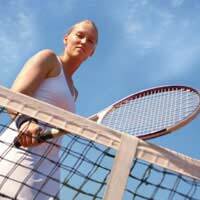 If your current club doesn't cater for racket sports, then shop around for one that does. There may be a small additional monthly charge for using the courts but you'll be getting a lot more for your membership than simply the tennis, badminton or squash facilities that a dedicated club would provide. Savings may also be made if there is a two-tier on and off-peak membership scheme available that makes it more economical to play outside the centre's busiest times. At the other end of the financial spectrum are municipal facilities that are accessible to the general public at relatively little cost. Given the budgetary restrictions faced by councils, and the cost of maintaining such facilities, many public tennis courts have disappeared in recent years. However, it is worth contacting the town hall to find out whether courts are still available. It is very unlikely that they will free; hourly fees are the norm but it will still work out cheaper than a gym membership, especially if you are only intending to play on an occasional basis. An alternate source of pay and play venues for tennis players across the UK can be found on the net at the Lawn Tennis Association's site. Similarly, Badminton England offers search facilities to find a club in your local area. There are lots of sites in the Internet that cover squash, badminton and tennis courts available in Scotland, Wales and Ireland too. The individual governing bodies are also charged with promoting their sport, so investigate the availability of coaching courses for different abilities and age groups that will allow you to play without being hit hard in the pocket. These schemes can also serve as a way of deciding whether you want to pursue the game, and perhaps making the financial commitment that membership of a dedicated club entails. Oh, and in case you were wondering how that cinematic head to head between Thomas and Carmichael turned out, let's say the moral victory belonged to the latter. He ended up with the love interest, too. What a result.